And afterwards, I’m not regretting it one bit. To be fair: it’s more that my wife mentioned to one of the organizers from our shul that I’d be taking the Monster straight to the site – it’s closer to our house than the shul is, actually, and I had no real reason otherwise to be at the synagogue this morning – and that I’d “probably” be willing to stay around to help chaperone. The Monster is in an adaptive Hebrew school class, and given that any extra hands on a field trip are probably helpful, it seemed reasonable for me to hang out and help wrangle my kid. (I’d say that the majority of his class came, and I wasn’t the only parent who stayed.) And for the record, I seriously appreciate that they included the adaptive class on this trip with a couple of other classes. The purpose of today’s field trip was a slightly-belated Yom HaAtzma’ut thing at the JCC, organized by a few local and national groups. A multitude of local Hebrew schools from around the area were bussing their kids over, which meant it was crowded and busy, and full of energy. 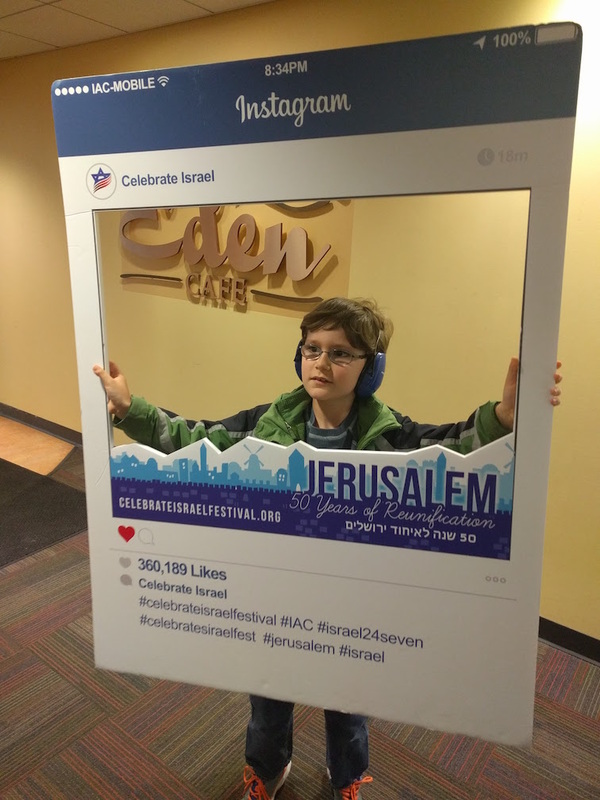 There was an area in the Auditorium to go do activities related to Israel and Jerusalem. The children got to make hummus with a bicycle-powered blender, do some painting, and listen to Israeli music. 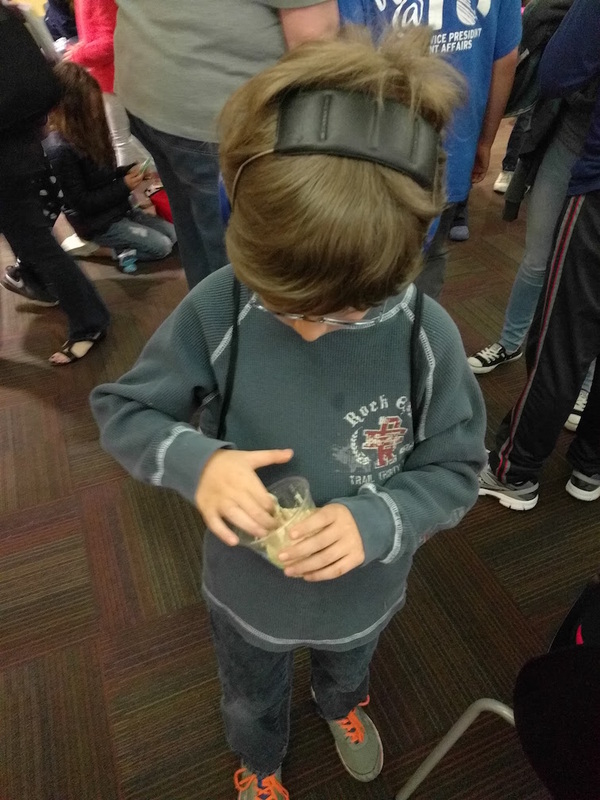 Then, after a while, the children were herded upstairs to the conference space so they could have a snack and participate in a virtual walking tour of part of the old city of Jerusalem, starting from one of the rebuilt synagogues and ending at the Kotel. I do hope they do this program again because it was neat for the children… but I can hope that they take things into account next time for special needs classes. By the way it works, it was very sensory-unfriendly (probably the most sensory-unfriendly setup for an event at the JCC that I’ve been to in ages). One of the parents did make a great comment that it’d have been better if something could’ve been arranged for us to take the class through as the first group before everyone got there, a head-start as it were to avoid the crush of people who were rushing about, coupled with additional time for our children, who can be slower at doing tasks, to take advantage of the whole thing. Because of pacing and the need to be intensive with our kids, we got to enjoy about half of the offerings in the auditorium before heading up for the presentation – you’ll notice I talked a lot more about the virtual tour than the activities downstairs, because we only got that far, and there were other activities we didn’t get to due to time. It was a great experience, but… as I said, tweaks could make it better still. … except that I don’t know how the Monster would handle the trip. (Not just the fourteen hours each way on the plane.) It’s not like planning a trip to the beach or Florida, in that we’re talking about stepping into a wholly unfamiliar landscape, where the language is different, where things are quite different from home… and even with him eating just about anything at this point (the kid was gobbling hummus down this morning like it’s going out of style, had an entire bag of Bissli without question even though he’s not seen it before) and being more easy going in general until he’s not, I just worry a lot. At some point, I’m going to have to get over my fear of the unknown on this and just bite the bullet.